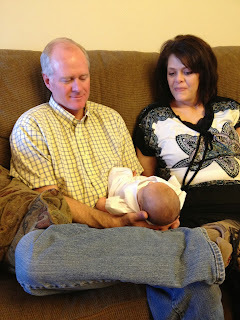 Rowan Daniel Tracy was blessed on June 2, 2013 at my parents house in Rigby Idaho. June 2 was actually his original due date, he was only 5 days old. We had to, or wanted to, have Rowan blessed by his Daddy before Danny had to go back to Kuwait. We believe that the priesthood that Christ had while he was on earth has been restored. 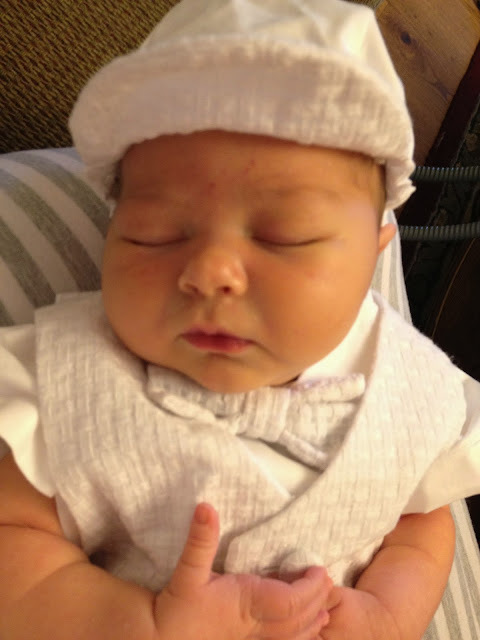 Blessing a baby and giving them a name is a priesthood ordinance practiced in our church. Danny, as a worthy holder of the Melckizedek priesthood, named and blessed our son. My Dad, grandfather, brothers and uncles stood in as he did. They also hold the priesthood. Getting Rowan Dressed for the blessing. I found this sweet little white suit online. It was pretty big on him, but that's ok, we were just grateful Danny was there to do it even if Rowan was only a few days old. 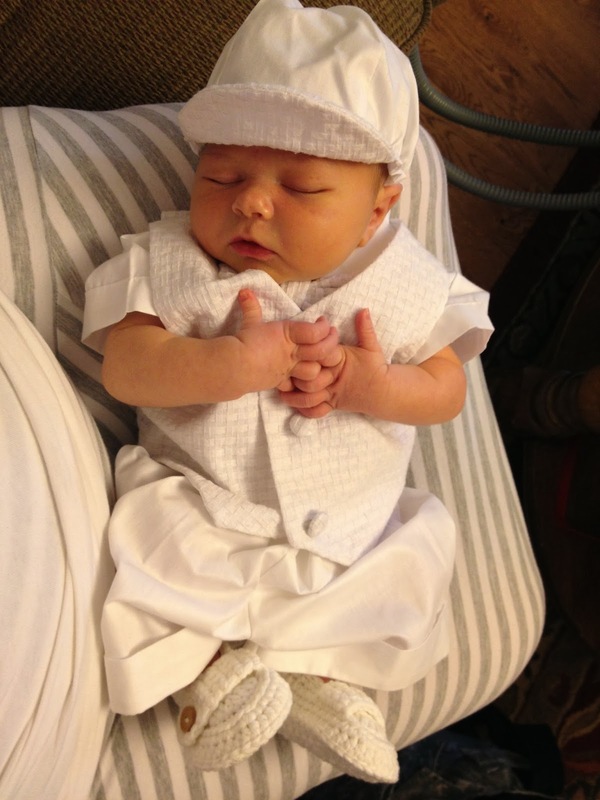 Sweet little jaundiced yellow bubba before his blessing. Danny fasted all Day before the blessing. We were both nervous. Danny hasn't had the opportunity to give many blessings in his life and most that he has were for the sick and done in private. He gave a beautiful blessing, he named our son Rowan Daniel Tracy and blessed Rowan. It was short, sweet, eloquently worded and powerful. Our home was flooded with the spirit, our hearts were touched and eyes were moist. I wish more than anything I could remember the words he said. The only specific I remember was that he said Rowan would be a light to others. I don't know why I can't remember the words, I think it's because the feeling I felt was much more overwhelming. I know this little boy is so loved, not just by us but by his father in heaven as well. Grandpa Keith Shipton came from Vernal Utah. I was so happy he was able to attend. I felt grandma Shipton close to me during my last months of pregnancy and during labor and delivery. She passed away last year and I know she helped Rowan to get to us safely. Sam and Carrie's family was able to come from Boise, It was great to see them! I hadn't seen this little guy since our wedding! She took the photo's too, thanks you guys! Mom and Dad admiring their first Grand-baby! Daddy got to visit again!